F This Movie! 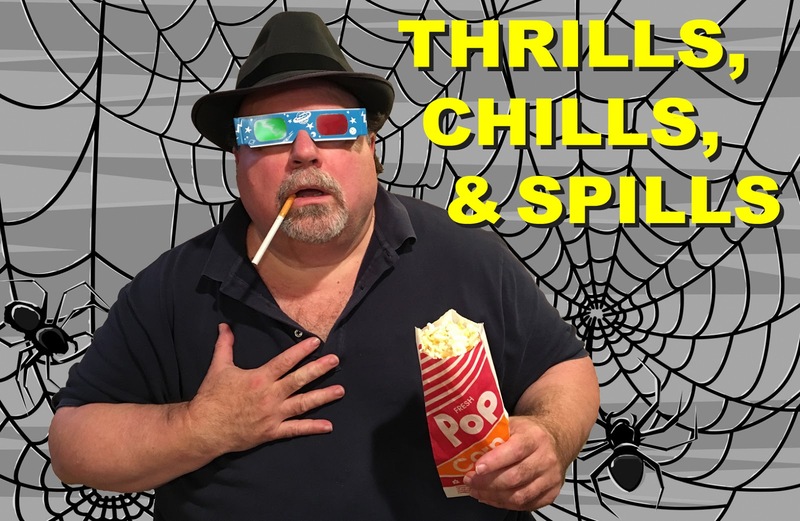 : Thrills, Chills, & Spills: DIE, MONSTER, DIE! This is the second horror movie I have been compelled to watch simply because the poster hangs in my garage. Thanks, garage! As I was watching Shout Factory’s terrific-looking Blu-ray of Die, Monster, Die!, several aspects of the film became, how shall I say, familiar. The film seems exactly like one of AIP’s Roger Corman/Vincent Price/Edgar Allen Poe films that were popular with audiences in the early 1960s. Die, Monster, Die! looks like them, sounds like them, and centers on a lead performance from a horror film legend (in this case, Boris Karloff.) Was the studio trying to repeat the success of its Poe series with a different literary source and actor? Yes, it was. Turning to the Interwebs, I quickly learned that AIP designed Die, Monster, Die! as a cash-in/follow-up to the Poe films, which were extremely lucrative for AIP. Unfortunately, there were a limited number of public domain Poe stories from which to draw scripts, Poe having died in 1849. Damn him! It worked. That movie’s success gave AIP confidence in its new source, and Die, Monster, Die!—based on Lovecraft’s justifiably famous short story, “The Colour Out of Space”—was rushed into production. The film was directed by Daniel Haller, who had previously served as art director on most of the Corman-Poe films. That was why the look of Die, Monster, Die! feels so familiar. 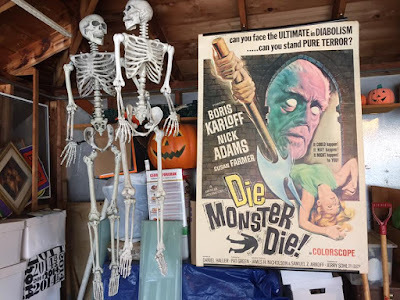 Reasoning that a star was needed to open a horror film, AIP enlisted Boris Karloff, who had previously appeared in AIP’s The Raven, The Terror, The Comedy of Terrors, and Bikini Beach; he would soon star in AIP’s The Ghost in the Invisible Bikini. 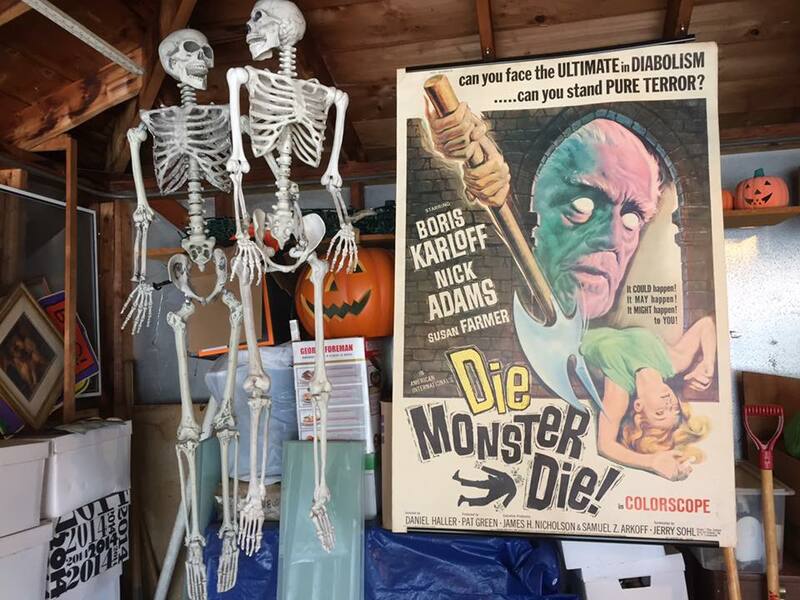 If any of my readers are fans of AIP, Corman, Poe, Lovecraft, or Karloff, you will enjoy Die, Monster, Die! Because this is a horror movie, Stephen ignores them and proceeds to the mansion. Strange goings-on are quickly afoot! The area around the mansion contains acres of burnt trees and an enormous crater. Susan’s father, Nahum Witley (Boris Karloff), greets Stephen at the door and tells him to go away, but Susan is there to welcome him warmly, and they wander around the castle. Why doesn’t Susan’s mother Letitia (Freda Jackson) want anyone to see her face? What’s with that greenhouse that glows green at night? Why won’t Nahum allow anyone in the basement? Why is this movie 80 minutes long? 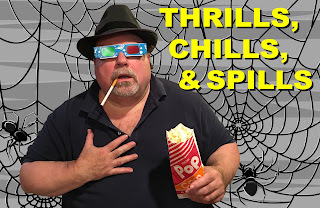 I have been watching heaping helpings of haunted house movies for Scary Movie Month this year, and their similarities begin to get frustrating after awhile. Most haunted house films owe a debt of gratitude to two original sources: the 1922 stage play The Cat and the Canary by John Willard and the 1927 novel Benighted by J.B. Priestly, which was filmed in 1932 as The Old Dark House. These two seminal works laid the ground rules for all the haunted house films that followed, and there were plenty; The Cat and the Canary has been remade at least six times. Clearly, this is a story that people like. Even non-horror films like Neil Simon’s Murder By Death; the film version of the popular board game Clue; and Sheldon Allman and Robert Pickett’s off-Broadway musical I’m Sorry, The Bridge Is Out, You’ll Have to Spend the Night have co-opted this resilient narrative framework. It goes like this: A group of people (the larger the better) is forced to spend the night in an old, deserted mansion. The reasons for this vary, but two favorites are inclement weather and the reading of a will. Various spooky incidents occur, and then the source of said spookiness is revealed during the climax. Sound familiar? As I said, it’s a durable plot. In practice, the success or failure of this narrative is based largely on the answers to three questions: 1) how well is each character developed and performed?, 2) how logical and scary is the second-act spookiness?, and 3) how scary and satisfying is the wrap-up reveal? In the case of old chestnuts like The Cat and the Canary and The Old Dark House, all three of these questions are answered beautifully: rich, real, developed characters; fine performances; truly scary shenanigans; and a clever denouement that does not insult the viewer’s intelligence. Die, Monster, Die! is a mixed bag, and flounders for a number of reasons. Nick Adams’ performance in the lead is wooden, to say the least; Suzan Farmer’s performance is even worse. The second act is almost totally devoid of spookiness because a majority of the audience has already figured the whole thing out. (I did, and I am not very smart.) This leaves a gaping maw in the middle of the picture where various characters do little but amble around chatting about nothing. In their Lovecraft cinema book Lurker in the Lobby, authors Andrew Migliore and John Strysik call this film “a textbook example of the walking-around-endlessly-in-a-big-house school of filmmaking.” I couldn’t agree more. This leaves the climax to explain things we already know, with unconvincing and amateurish special effects. I am still recommending Die, Monster, Die!, though. It offers beautiful cinematography and art direction; a terrific, modulated performance by Karloff; and superior source material from the great H.P. Lovecraft (“Cthulhu? I hardly know Lou.”) There is still a lot to love here. Sometimes we cannot always dine on a Poe steak, and we have to make do with a Lovecraft potpie. But sometimes, are we not in the mood for potpie? Yes. Especially a Die, Monster, Die! potpie that glows an unsettling shade of green at night. Around eight years ago I went on a reading binge of H.P. Lovecraft and similar writers of his period. (Algernon Blackwood remains my "weird" author from that time.) The Colour Out of Space is undoubtedly the best written story I encountered from Lovecraft, lacking the repetition so common to his work. In any case, this article is about DIE, MONSTER, DIE!. I probably saw this for the first time on Turner Classic Movies in the 2000s. Besides the presence of Karloff, it did not stand out. It certainly is not the worst way to pass 80 minutes, though. There were no regrets watching it. The film does have a nice poster, JB. Am I a fan of AIP, Corman, Poe, Lovecraft, and Karloff, yes, yes I am. Thanks for another fun looking title! I wish I watched The Old Dark House before this year but so glad I got to it! Talking of Lovecraft, have you heard of the game Tides of Madness? I just played it earlier tonight, it is a game I really enjoy. The artwork is pretty good for SMM too. We should all look forward to the new restoration of The Old Dark House on blu-ray! It's being released this Tuesday, 10/24. It's going to be my Halloween present to myself.